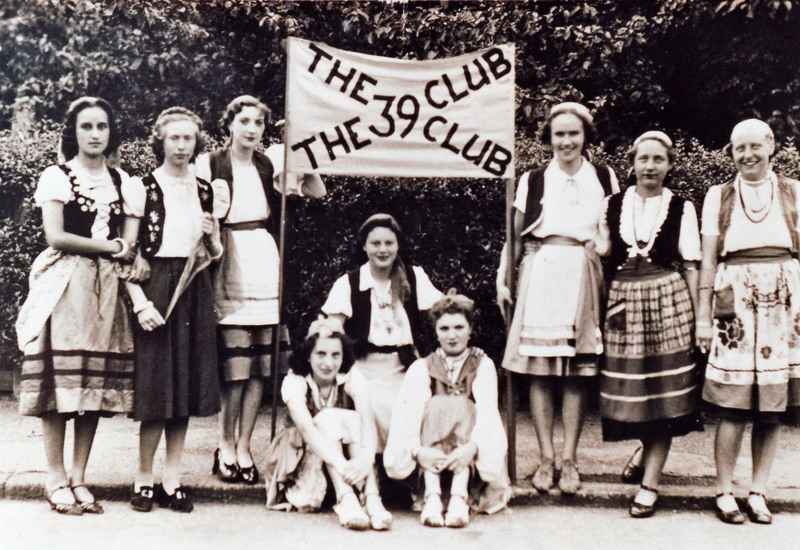 For sometime I had been meaning to write a piece on the Hadleigh 39 Club as two wonderful photos were loaned to me. This article was prompted by the sad death of one of the original organisers of the club, Mrs Pearl Jones of Thorpe Bay, who had lent me the photos. In 1939 she was still Pearl Choppen, had been born in Hadleigh in 1921 and lived mainly in Hadleigh until 1949. 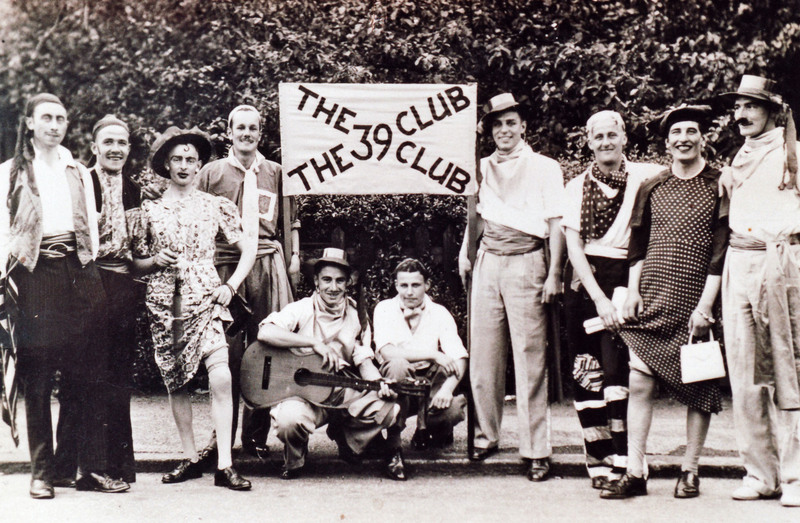 I am sure you will not be surprised to know that the 39 Club was formed in 1939. Exactly whose idea it was I do not know but a group of friends in their late teens and early twenties had been attending the occasional Hadleigh, South Benfleet and Thundersley social events for some years and they formed the heart of the club. Pearl Choppen, Frank her brother and Nancy, his wife of two years, were three of the keenest. Mr Freeman was the chairman. The club organised social events such as dances and tennis games. Pearl was a dab hand at organising which stood her in good stead when she later became Head of Personnel at the old GPO Telephones Offices in Victoria Avenue, Southend. She was a great collector of memorabilia amongst which collection an executor discovered a large notebook dealing with the Tennis Section of the 39 Club. The book is foolscap size and originally held some seventy pages but only nine pages have been used. Pearl told one of her nephews that the club began in 1939 but once the war was underway it faded quickly. Call-ups, volunteering, evacuation and other war work put paid to a promising social enterprise. So many things were interrupted by the war. Fancy dress seems to have proved popular as the two photographs show. I wonder if there is anyone out there who can tell us what they were up to. Perhaps they were dressed for the Hadleigh & Thundersley Carnival. Both the women and the men look gypsy in their dress although the men are more chaotically dressed than the women who seem to have hit upon a certain style. Tennis activities were held once a week and ran in 1939 from June to August. The charge to members was one shilling. It looks as though tennis did not continue into 1940 but the book contains records of the club`s annual subscriptions of half a crown (for youngsters reading this: 2 shillings and sixpence). Club Nights were held from March to May 1940 for which a charge of 3d was made. The final meeting appears to have been 9th May. Tennis courts had to be hired from a Miss Caton. Who was she? Where were the courts? In 1939 the courts cost the club £7 .. 6s .. 8d. Deck chairs were hired (or bought?) from W. Newman for 11s .. 8d. Total cash from members totalled £9 .. 3 .. 6d so a surplus was achieved. “Visitors” were welcomed to tennis and meetings and duly paid their shillings or threepences. As the list is not too long, I thought readers would like to know who the members were and in some cases their addresses. Perhaps seeing the names might jog the memories of some of you. We would love to see your comments. Mr. Fred. Norman; Mr Frank & Mrs Nancy Choppen of Goodrington, New Road, Hadleigh; Miss Pearl Choppen of “Burnham, Western Road, Leigh; Miss D. Norman; Mr Harold. Norman; Miss Dolly Fletcher; Mr S. Farmer; Mr Reg Norman of “St. Leonards”, Church Road, Hadleigh; Miss E. Finch; Mr F. Colgan of 102 Southdown Avenue, Leigh; Mr Stanley. Root; Mr Ray. Norman; Mr E. Moule, 3 Victoria Parade, Thundersley; Mr Alfred. Watson of 5 Lessier Parade; Mr Cyril Hill of 139a Hamlet Court Road, Westcliff; Miss V. Adams; Mr Alfred. Bush; Miss Mildred Marshall; Mr L. Waller; Mr E. Graham; Mr J. Falkus: Miss M. Carter of “Inglenook”, Kents Hill Road, Thundersley; Mr E. Freeman of “Havengore”, 117 Fleming Avenue, Leigh; Mr F. Bambury of “Bude”, Hall Crescent, Hadleigh; Mr F. Smith of 243 Highlands Boulevard, Leigh; Miss W. Kent of 12 Walker Drive, Leigh; Mr A. Patten & Mr R. Patten of “Rosedene”, Woodfield Road, Hadleigh; Miss D. Griffiths of 80 Fleming Avenue, Leigh; Mr L. Faux of “Briarcot”, London Road, Hadleigh; Mr W, Cronin of 22 Cricketfield Grove, Leigh; Miss Peggy Stibbards of “Windermere”, Coombewood Drive, Thundersley; Miss Barbara Wild of “Beryldene”, The Avenue; Mr C. Allen of 193 Highlands Boulevard, Leigh; Mr C. Chase of 1 Fairview Villas, Lynton Road, Hadleigh; Miss Gwen Pend of 4 Elsie Villas, Church Road, Hadleigh; Miss Molly Hinde of 307 Hamlet Court Road, Westcliff; Arthur Len or Sen? of Queenston, Daws Heath Road, Rayleigh; Mr J. Bennett of Rayleigh; Miss Edna Streames; Miss R. McNeil of “Glenroy”, The Crescent, Hadleigh; Barbara & Micky Werrell. Miss Betty McGeown of “Edencourt”, Eastwood Road, Eastwood; Mr Basil Sheen of “Delamere”, London Road, Hadleigh; Miss Maud Wilks of “Fairview”, Overton Road, New Thundersley; Mr B. Body; Doreen Crabb; R. Gaskin of 1428 London Road; Pauline Barratt; Miss P. Webb; Miss Elaine Millard of 37 Glenmere Avenue, Thundersley; Majorie Ealie; Miss Miriam Hudson. When I find the time I intend to search the Southend Standards for 1939 and 1940 for further information. Is there anyone out there who was a member of the 39 Club who can add some first hand information to develop this story?